Win a pair of Sanuk shoes or sandals in the Junkets & Jaunts Travel Gear Giveaway. A pair of Sanuks are up for grabs! “Made for the journey to your happy place” is an apt slogan for Sanuk footwear. And a pair of Sanuk shoes or sandals are the latest accessory up for grabs in the 2019 Junkets & Jaunts Travel Gear Giveaway (rules below). 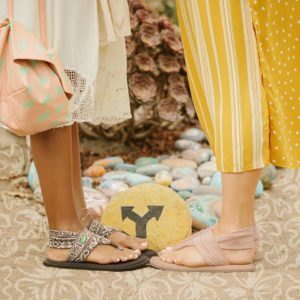 Sanuk is actually the Thai word for “fun.” The company’s novelty brand of sandals includes men’s, women’s and kid’s footwear like Flip Flops, Yoga Mat Sandals, Sidewalk Surfers, the Yoga Sling 3, Beer Cozy Sandals and more. Sanuks—worn by the likes of singer/songwriter/surfer Donavon Frankenreiter—are made of comfy materials like yoga mats and other environmentally conscious products. The company also partners with the Surfrider Foundation. Go to Instagram and like both @junketsandjaunts(feel free to leave a fun message!) and @sanuk. Go to JunketsAndJaunts.com and sign up for the mailing list at this link. That’s it! The deadline to enter is noon PST on April 26, 2019. Congrats’s to last month’s 2019 Junkets & Jaunts Travel Gear Giveaway winner: San Diego’s Alyson Osterberg. 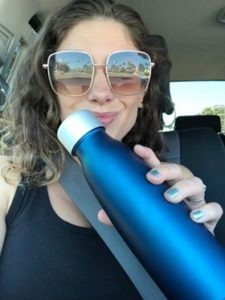 She won the high-tech DrinKup water bottle that can remind you to stay hydrated while traveling. DrinKup is a tech lover’s dream. It integrates with mobile devices, Apple Health and Fitbit, and can record a users’ hydration routines and send electronic reminders when it’s time to “drink up!” The water bottles ($69) come in sky blue, baby pink, arctic white, midnight blue, coral red and lemon yellow. Vicky Chinery of Stewartstown, PA. She won an OGIO Alpha Convoy 525r backpack. 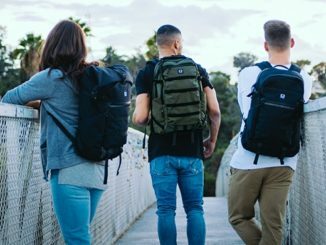 The multi-configuration, roll-top closure backpack is made from Cordura® EcoMade fabric, which is ultra-durable, lightweight, and made from recycled plastic. The OGIO pack has a zippered side entrance for access to the main compartment and includes a dedicated laptop and tablet sleeve ($129.99). Jordan Lemke of Point Loma, CA. She won a pair of Stealth II Vivobarefoot The no-sew construction of this premium footwear is durable and flexible. The breathable recycled PET mesh keeps feet cool. And the fact that they weigh just about four ounces also makes them ideal to pack as a second pair of shoes when traveling. Comes in black and white ($130).